Guangzhou Steel & Iron Co.
Line 1 of the Guangzhou Metro runs from Xilang to Guangzhou East Railway Station (18.5 km). Apart from Kengkou and Xilang, all stations in Line 1 are underground. The first section, from Xilang to Huangsha, opened on 28 June 1997, making Guangzhou the fourth city in mainland China to have a metro system. The full line started operation two years later on 28 June 1999. Line 1 is coloured yellow. Line 1 drawn to scale. 1984 - The municipal government set up the Preparation Office of Guangzhou Metro. 14 March 1988 - Chinese and French co-planning team publish four tentative designs of Line 1 and Line 2. 28 December 1993 - Construction of Line 1 officially commenced. 28 June 1997 - Line 1 opened for trial operation. 28 December 1998 - The entire Line 1 was completed. 16 February and 2 March 1999 - The entire line enter sightseeing tour trial operation. 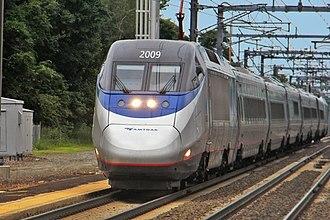 28 June 1999 - The entire line officially enter operation. ^ 879万人次！2015年最后一天广州地铁客流创历史新高 [8.79 million people! Guangzhou Metro achieved daily ridership record on the last day of 2015] (in Chinese). Nanfang News. 4 January 2016. Retrieved 2015-01-04. Allgemeine Elektricitäts-Gesellschaft AG was a German producer of electrical equipment founded as the Deutsche Edison-Gesellschaft für angewandte Elektricität in 1883 in Berlin by Emil Rathenau. After World War II its headquarters moved to Frankfurt am Main, in 1967 AEG joined with its subsidiary Telefunken AG creating Allgemeine Elektricitäts-Gesellschaft AEG-Telefunken. In 1985 Daimler-Benz purchased the AEG-Telefunken Aktiengesellschaft, which was renamed to AEG Aktiengesellschaft, the remains of AEG became part of Adtranz and Deutsche Aerospace. After acquiring the AEG household subsidiary AEG Hausgeräte GmbH in 1994, in 2005 Electrolux obtained the rights to the brand name AEG, the AEG name is licensed to various brand partners under the Electrolux Global Brand Licensing programme. 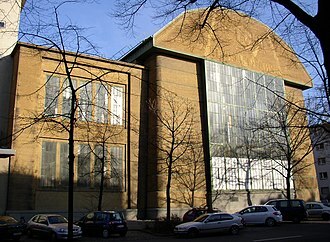 In 1883 Emil Rathenau founded Deutsche Edison-Gesellschaft für angewandte Elektricität in Berlin, initially producing electrical equipment, the company soon became involved in AC electric transmission systems. In 1907 Peter Behrens was appointed as consultant to AEG. This led to the creation of the initial corporate identity, with products. The company expanded in the first half of the 20th century, during the same period it entered the automobile and airplane markets. Electrical equipment for railways was produced during this time, beginning a history of supplying the German railways with electrical equipment. After WWII, the company lost its businesses in the part of Germany. After a merger in 1967 the company was renamed Allgemeine Elektricitäts-Gesellschaft AEG-Telefunken, the company experienced financial difficulties during the 1970s, resulting in the sale of some assets. In 1983 the consumer electronics division Telefunken Fernseh und Rundfunk GmbH was sold, under Daimler-Benz ownership, the former AEG companies eventually become part of the newly named Adtranz in 1995 and the AEG name was no longer used. Electrolux, which had acquired the household subsidiary AEG Hausgeräte GmbH of AEG in 1994. Guangzhou, traditionally romanised as Canton, is the capital and most populous city of the province of Guangdong in southern China. Guangzhou is currently, the third city in mainland China, behind Beijing and Shanghai, holds sub-provincial administrative status. In 2015 the citys area was estimated to have a population of 13,501,100. Some estimates place the population of the area of the Pearl River Delta Mega City as high as 44 million without the Hong Kong SAR and 54 million including it. 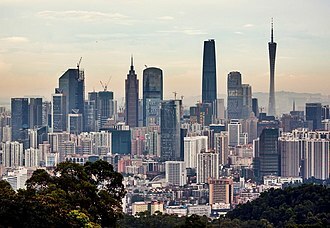 Guangzhou is ranked as a Beta+ Global city, in recent years, there has been a rapidly increasing number of foreign residents and illegal immigrants from Southeast Asia, the Middle East and Eastern Europe, as well as from Africa. This has led to it being dubbed the Capital of the Third World, the migrant population from other provinces of China in Guangzhou was 40 percent of the citys total population in 2008. Long the only Chinese port accessible to foreign traders, the city fell to the British during the First Opium War. No longer enjoying a monopoly after the war, it lost trade to ports such as Hong Kong and Shanghai. In modern commerce, Guangzhou is best known for its annual Canton Fair, for the three consecutive years 2013–2015, Forbes ranked Guangzhou as the best commercial city on the Chinese mainland. Guǎngzhōu is the pinyin romanisation of the Chinese name 廣州, which was simplified in mainland China to 广州 in the 1950s, before acquiring its current name, the town was known as Panyu, a name still borne by one of Guangzhous districts. The origin of the name is uncertain, with 11 various explanations being offered. The city has sometimes been known as Guangzhou Fu or Guangfu after its status as the capital of a commandery. From this latter name, Guangzhou was known to medieval Persians such as Al-Masudi, under the Southern Han, the city was renamed Xingwang. Under the Qing, it was known to its inhabitants as simply The Provincial Capital. The Chinese abbreviation for Guangzhou is 穗, after its nickname Rice City, the former name City of the Immortals came from the same story. 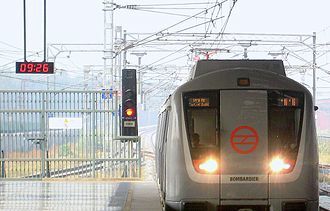 Bombardier Movia is a family of metro train built by Bombardier Transportation. The structure and body shell are fully customisable for the needs of each system that orders it, unlike most traditional metro trains, they usually have full-width gangways between carriages, allowing passengers to walk the entire length of the train. The design was developed by Adtranz which was acquired by Bombardier in 2001, guangzhou Metro, Shanghai Metro, and Shenzhen Metro all use Movia 456 trains, while Bucharest Metro use the Movia 346. Movia trains are on order and entering service for the London Underground, Toronto Subway, Singapore MRT has accepted an order of 92 C951 trains, one of the largest orders in Singapore. Shanghai Metro -134 six-car units, Shenzhen Metro -22 six-car units. Delhi Metro 614 cars - Phase II Metrorex 44 trains SBSTransit 92 three car trains, on the MRT Downtown Line in 2013 C951 Bangkok BTS Skytrain 17 four-car units. Delivered on June 25,2010 and enter service late 2010 on the Silom line running between the National Stadium and Wongwian Yai stations. Tianhe District is one of the eleven districts of Guangzhou in the province of Guangdong. In Chinese, the name Tianhe literally means a river in the sky/heavens and it is bordered by Yuexiu District on the west, Baiyun District on the north and Huangpu District on the east. Haizhu District is on its south, though they are separated by the Pearl River, Tianhe became a district in the 1980s as the city expanded its size. Back then, it was east of Dongshan District and it was more suburban like if not rural like, even though a majority of colleges and universities in the city were located in the district, the rest of the district was mostly composed of rice fields. Symbolic landmarks of Guangzhou located in Tianhe District are, Citic Plaza, Guangzhou International Finance Center, Guangzhou Opera House, the 6th and 9th of The National Games of the Peoples Republic of China, and the 2010 Asian Games were held in Tianhe District, Guangzhou. Prehistoric population settled in what is now Longdong Subdistrict in the Neolithic Period, eastern Han tombs were discovered in Tianhe. During the Song Dynasty, Tianhe area was called Dashuixu, the area of modern Tianhe District was part of Panyu County for more than two thousand years. The area was put under Guangzhous administration between 1937 and 1958. By the liberation of Guangzhou, there were two districts in Tianhe area, namely Shahe and Shipai, in 1951 both districts were merged into the newly established Baiyun District, while five years Baiyun was further merged with Huangpu and Xinjiao Districts to form suburban district. In 1960 Jiaoqu was dissolved and the area consisting of modern Tianhe became Huangpu District, in 1985 part of Jiaoqu was split, and Tianhe District was established then. 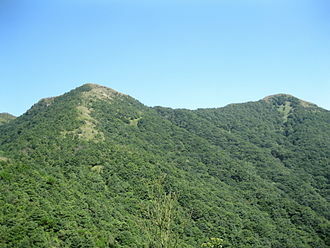 In 1987 Tonghe Town was put into Baiyun District, in 1992 Yangji Cun was put into Dongshan District. By 1994, Kemulang and Fenghuang Farms along with Shadongcun and Erduicun were placed under Tianhes jurisdiction, in 2000, former Xintang, Mubei and Yushu Farms were placed under Tianhe and the farms gradually became subdistricts. Guangzhou ("Canton") and the surrounding islands of Henan ("Hanan"), Pazhou ("Whampoa"), Changzhou ("Dane's Island"), and Xiaoguwei ("French Island") during the First Opium War's Second Battle of Canton. The large East Indiamen of the Canton trade used the anchorage sheltered by these four islands, but the village and island of Huangpu for which it was named make up no part of present-day Guangzhou's Huangpu District. 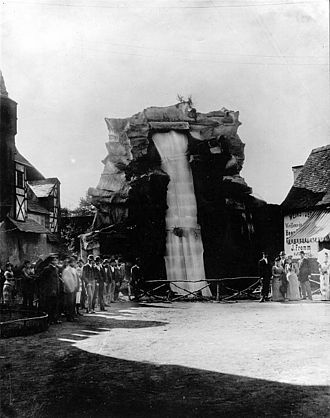 Artificial electrically powered waterfall at the International Electro-Technical Exhibition – 1891. AEG power station built in 1930. Krivoy Rog city. A C951 train in Kim Chuan Depot. Line 11 drawn to scale. Line 18 drawn to scale.